Happy Friday friends! 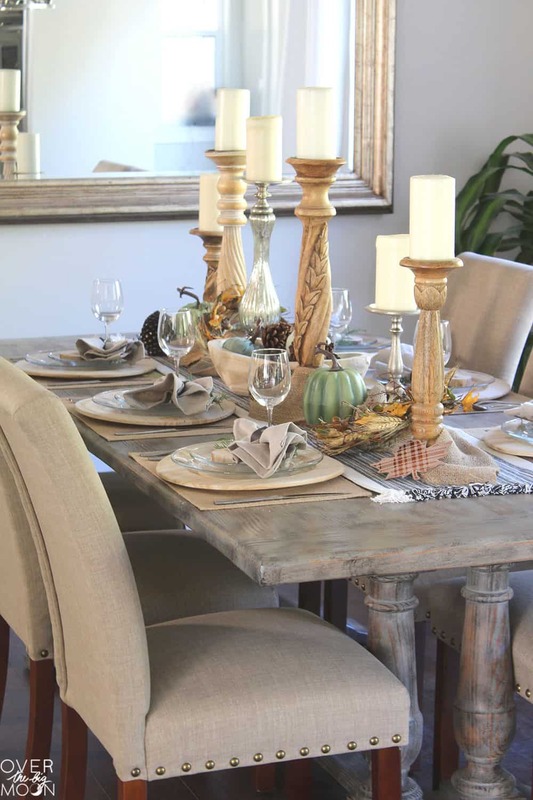 Today I am so excited to share this Elegant Farmhouse Thanksgiving Tablescape! If you have know me at all, you know that I generally gravitate towards a neutral color theme for my decor, but I also love adding green to any space! 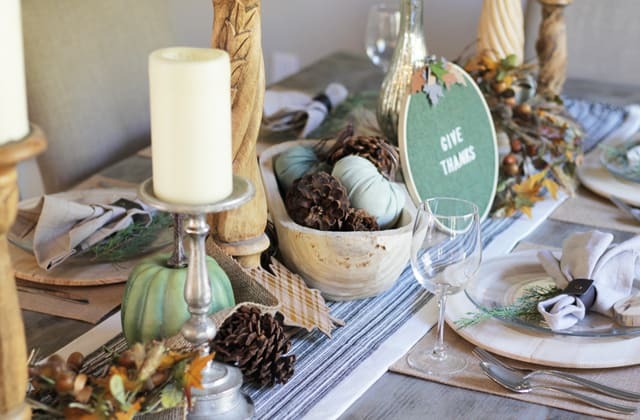 By adding in these simple green colors, it brought nature indoors and created the perfect Thanksgiving tablescape! 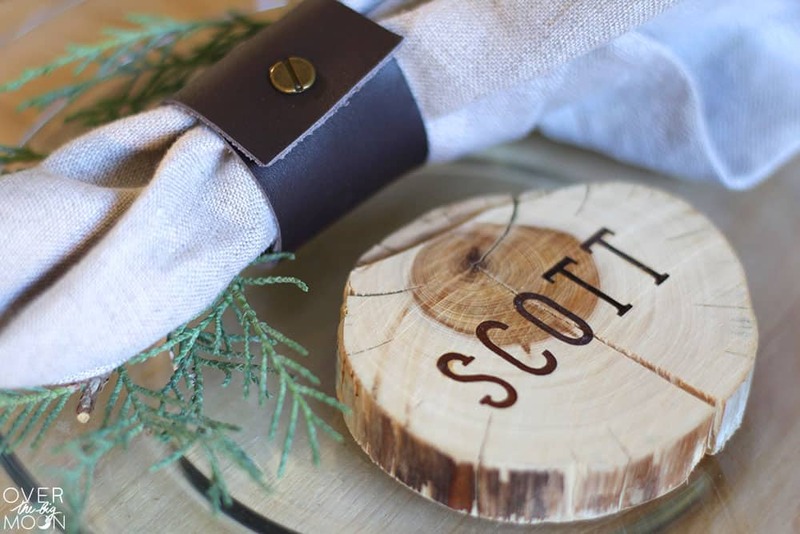 I’m also excited to share the tutorial for making these fun Wood Slice Place Cards using Iron-on Vinyl and my Cricut Maker! I started by finding the natural wood chargers at our local Michaels! I wanted to keep it all very fluid with the nature theme, so the clear dishes were a perfect fit! 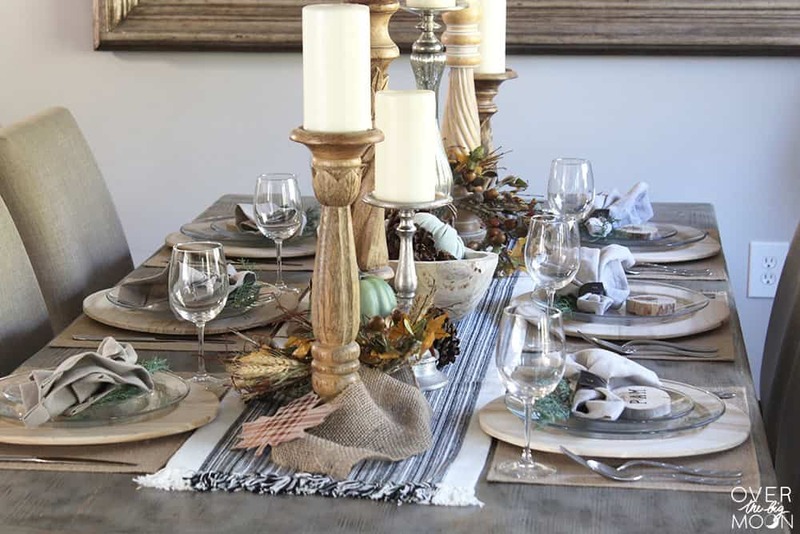 Anything linen or burlap – the linen / burlap color only adds to the farmhouse feel. 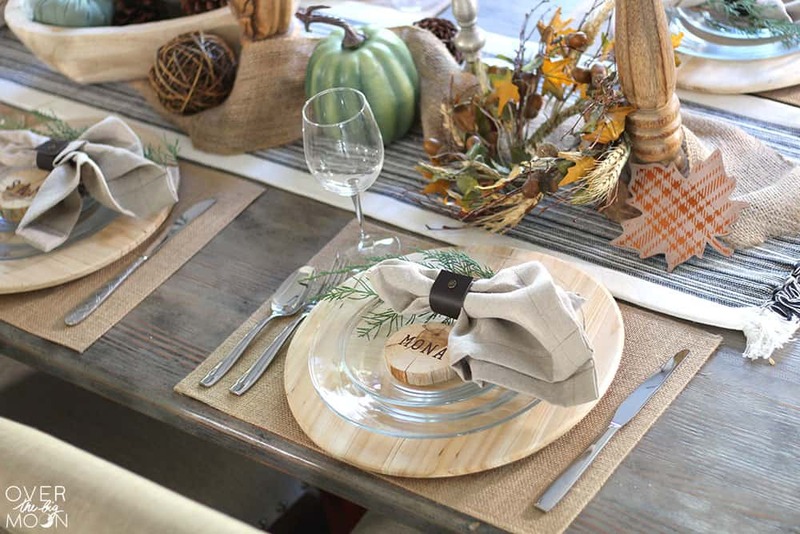 I added it in with the placemats, napkins and burlap ribbon down the center of the table. Clear dishes & glasses – This helps not take from the nature look. However, I think adding white dishes wouldn’t ruin it either! Mixing in a little metal – I didn’t want it feeling heavy with all the wood textures, so we added the few silver candlesticks to go with the silverware! 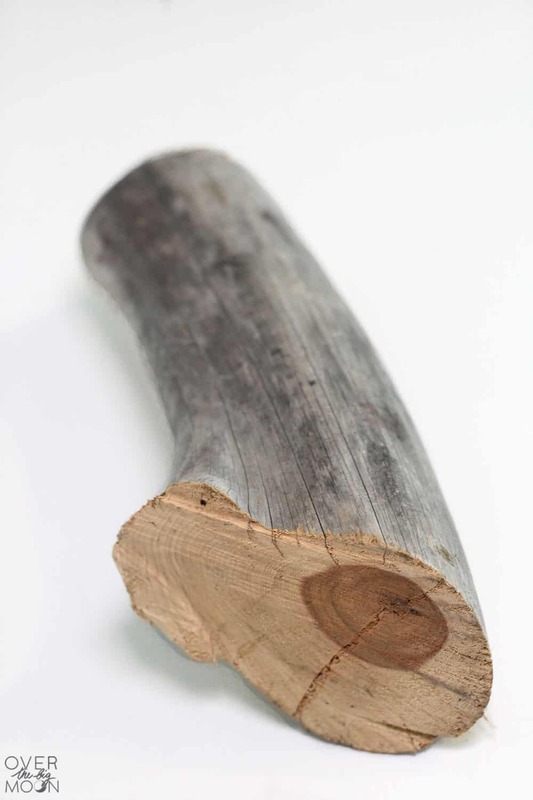 I love how it broke up the woods! 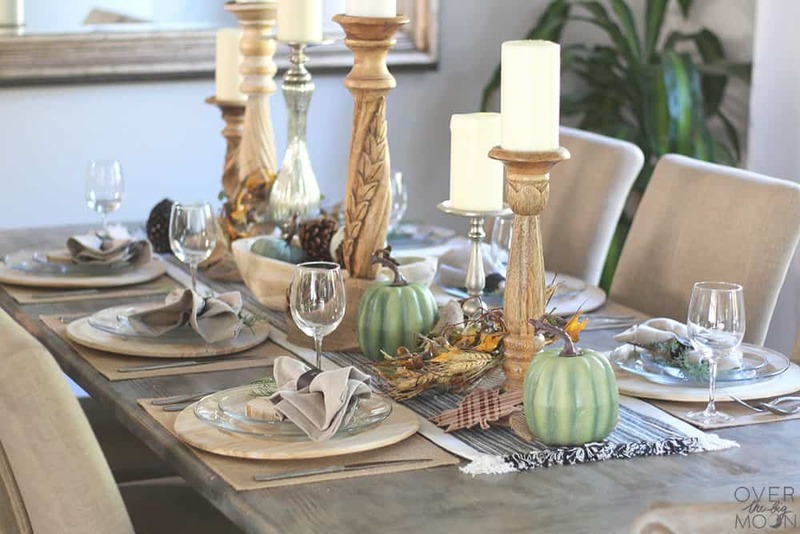 Pumpkins, wheat, pinecones, and other elements from nature – I really think this is what brought my table to life! The pinecones and evergreen tree snippets are my favorite! We literally went outside and cut them off the tree! I wanted a really rustic look to my thanksgiving place cards, so we jumped on the four-wheeler and headed up the mountain behind our house. My husband spotted this awesome piece of wood! Holy gorgeous right? The textures and shape – it was perfect! 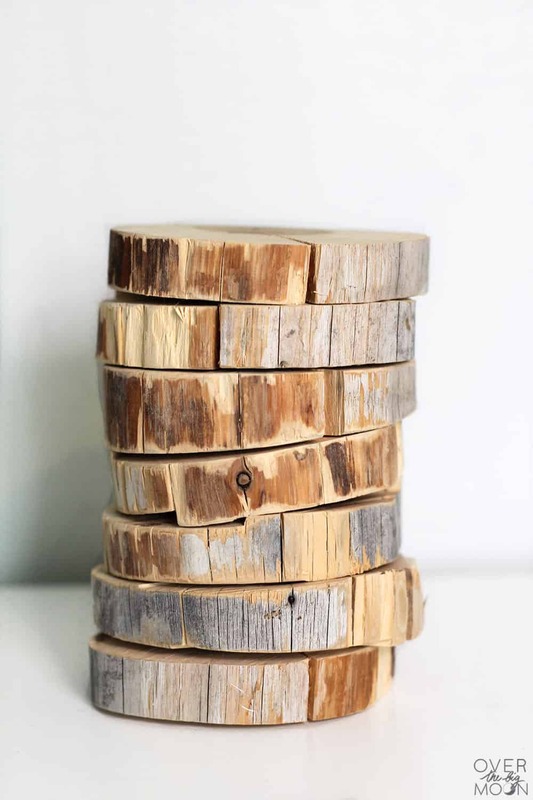 If you don’t have time or a place to go find a scrap piece of wood though, you can totally just buy some craft wood slices at your local craft store or on Amazon. We took the wood out the garage and used our miter saw to cut it into wood slices. I loved the texture and cracking, but I did have to add a little hot glue to two pieces to give them better strength. Next, I got the the files made in Cricut Design Space. Click the link HERE to use my same file. Feel free to change up the font and make sure to resize the name to fit on your specific wood slices. 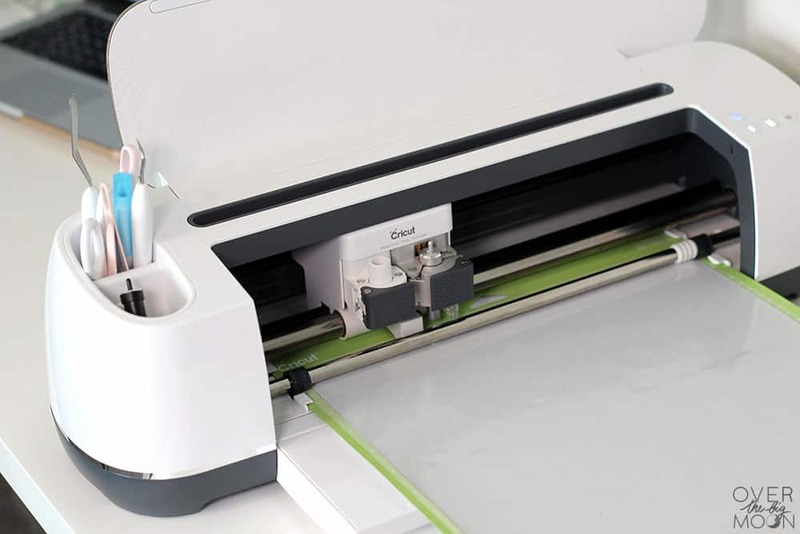 Remember when using Iron-on vinyl that you need to mirror the image in design space and when applying the iron-on vinyl to your mat, to put the shiny side down! Once the names are cut out using your Cricut Maker, cut them into individual names and then remove the backing. Then heat the wood slice for a few seconds and center the name on the wood slice. Apply heat on the name using your home iron or EasyPress. For my easy press I had it set to 325 degrees and I applied heat for 30 seconds, removed it for a few and applied pressure with my finger for a few seconds and if needed applied 15 more seconds of heat. 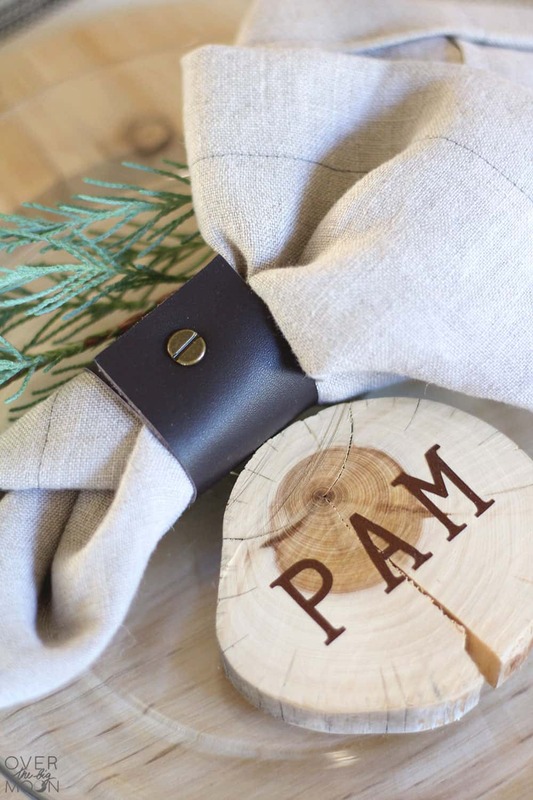 Because the wood has texture, I wanted to make sure the name adhered everywhere. And that’s it! They turned out so fun, huh? 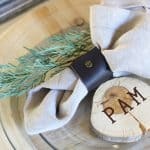 If you want to see another awesome DIY that would pair perfectly with this tablescape, check out these Letter Board Embroidery Hoops that my friend Holly at My Sisters Suitcase created and photographed at my Thanksgiving table! 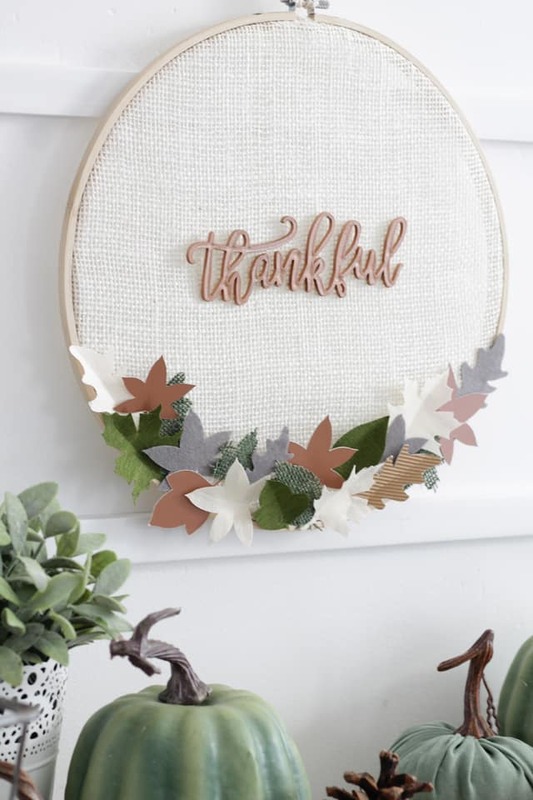 She used my Cricut Maker to cut out all the different foliage! 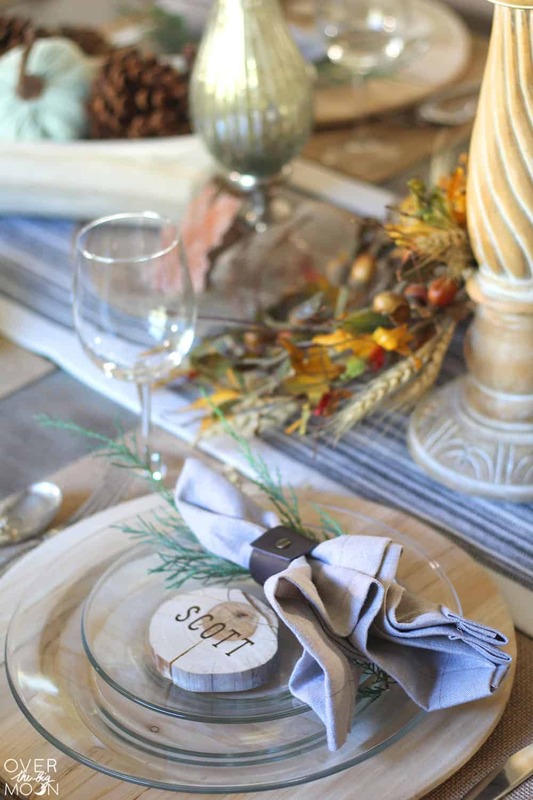 If you love this Elegant Farmhouse Thanksgiving Tablescape and Wood Slice Place Cards, I’d love for you to pin the images below! This seriously looks like something straight off the cover of a magazine! 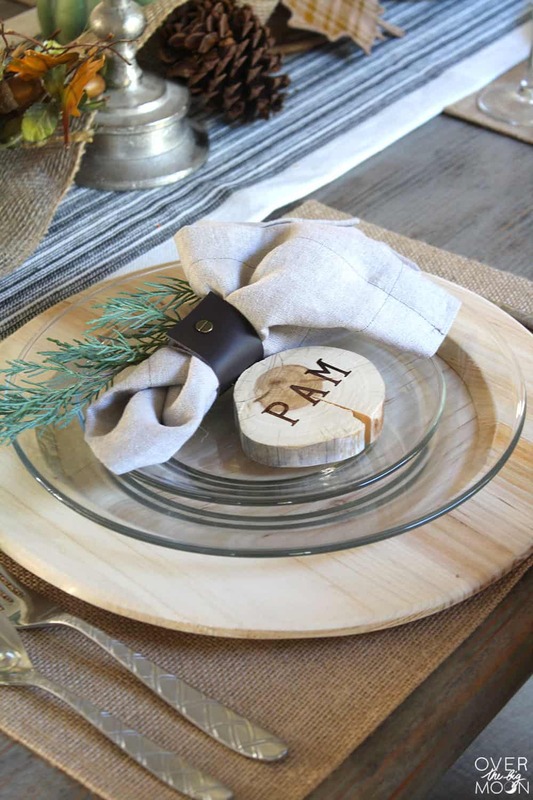 I love the neutral colors and those place cards are so fun!